Welcome to The Lion King Experience! We've created this innovative and rigorous theater curriculum to help schools and community groups bolster their arts-education offerings. The Lion King is a show unlike any other - from its global inspirations, to its magnificent score, to its design possibilities, your production of The Lion King is an opportunity to create a sophisticated piece of art with young people. The Lion King Experience includes a license to produce The Lion King KIDS or The Lion King JR. and features sessions designed to introduce your students to a wide range of theatrical skills through the lens of the show. The Lion King Experience will allow educators and students to explore theater from many different angles including: performance, design, directing, writing and technical theater. The Lion King Experience employs student-driven, project based learning so that educators from varied backgrounds can introduce their students to the creativity and joy of the arts. Site Access & Binder When you purchase The Lion King Experience you get full access to this website, which has been optimized for use on smartboards, tablets, and desktop computers. It includes videos to introduce students to the theme of the day’s learning, lesson plans for each session, and accompanying Pride Challenge Sheets from which your students will work. TheLionKingExperience.com also includes assessment forms, a pre-and-post Experience evaluation for tracking your class’s growth, and comprehensive charts detailing the various educational standards fulfilled, and skills used by, each session. Your purchase of The Lion King Experience also includes a ShowKit™ filled with tools to help you produce your own version of The Lion King. After you purchase The Lion King Experience, you will receive an email that contains a link to activate your account. You will have 365 days to access the site after your initial activation. 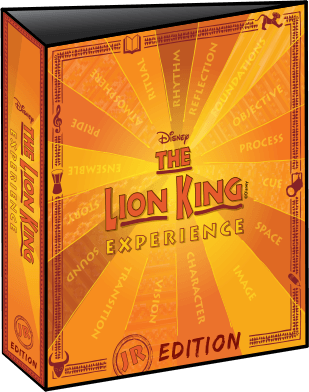 The complete Lion King Experience will also be sent to you in a binder with DVDs and data discs so that you can access the material no matter what your classroom resources may be; you will also receive your ShowKit™ in this shipment. Djembe Drums The Lion King Experience incorporates three djembe drums, which are included in your shipment of materials. These drums are a centerpiece of the learning throughout the Experience, and can additionally be used to supplement your accompaniment CD during your rehearsals and performances of your production of The Lion King. Your students will use these drums in their daily warm-up, and throughout their group explorations. Students using the djembes can do so from a seated position to properly strike notes as demonstrated in the videos, or from a standing position with one hand if energy and movement are more important in your classroom. Over time, the djembes will connote identity for your class, so it’s important they are stored and handled with respect. Totems Your shipment also includes blank wooden totems that your students will use to adorn the djembe drums at the beginning of the Experience, and to commemorate their accomplishments at the end of the project. Each of the 11 sessions in The Lion King Experience follow the same structure. Each session begins with an introductory video, which includes a drumming and vocal warm-up. The sessions are organized by theme: Introduction, Pride, Plot, Character, Space, Language, Music, Movement, Vision, Spectacle, and Reflection. The themes are based on Aristotle’s poetics and other elements of drama. The sessions span 45 minutes though some suggest longer periods to capitalize on the theme’s learning (Session 9: Vision can be extended to 60 minutes, Session 10: Spectacle is 60 minutes, Session 11: Reflection is 90 minutes). Each session is launched by a video introduction, which introduces the warm-up, theme, and key concepts for the session. Following the video, students participate in a teacher–facilitated group activity outlined in the Lesson Plan. Next, the class divides into three small groups called Prides to work on different projects related to the session’s theme. Each Pride receives a Challenge Sheet outlining their task for the day. While the Challenge Sheets will sometimes feature different characters or scenes, the activity is the same for each Pride. At the conclusion of the activities, the Prides share their work with the class. Finally, the students participate in a culminating group reflection. Each session includes optional journal prompts that students can complete as homework. The Pride Journal assignments encourage students to draw connections between their work in The Lion King Experience and their own lives. Each of the 18 sessions in The Lion King Experience follow the same structure. The sessions are organized by theme: Introduction, Pride, Rhythm, Ritual, Story, Foundations, Process, Objective, Character, Ensemble, Vision, Image, Transition, Space, Sound, Atmosphere, Cue, and Reflection. Each theme is a broad theatrical concept that can be explored through many angles. For example, in Atmosphere, students learn to create theatrical atmosphere using sound, lighting, and movement. The sessions span 45 minutes though some suggest longer periods to capitalize on the theme’s learning (Session 12: Image can be extended to 90 minutes, Session 18: Reflection is 60 minutes). Early in the Experience, students create an Opening Ritual composed of student-devised drumming, physical, and vocal warm-ups. Each session is launched by a video introduction, which introduces the theme and key concepts for the session. Next, the class divides into three small groups called Prides to work on different projects related to the session’s theme. Each Pride receives a Challenge Sheet outlining their task for the day. Whether accessing them online or in your binder, your lesson plans are your map to The Lion King Experience. As you would with any lesson, devote some time to reading the plan in advance of the session so that you can prepare your space, gather any additional materials, or make necessary modifications to best serve your students. Each session includes step-by-step instructions for facilitating the day’s learning, and many include “teacher tips” that suggest modifications, facilitation notes, or enrichments you may wish to include. Many sessions require the use of specific materials. Materials we have included are listed as Provided Materials at the top of each Lesson Plan. Hard copies of printable materials can be found within each session tab of your binder (following the Lesson Plan and Challenge Sheets). 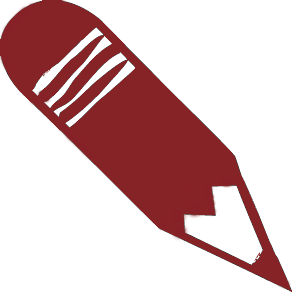 Additional materials that you will need to provide, like coloring utensils or construction paper, are also listed at the top of each lesson plan. In the top right-hand corner of a Provided Material, you will find a key for where in the lesson the provided Material is used. Digital copies can be found on your Experience Materials Disc and at TheLionKingExperience.com, along with sound and video materials. Ensure that you have the capacity to access these audio/visual resources in your space. 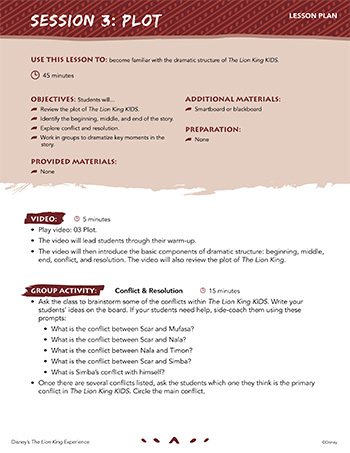 If you opt to include the suggested homework in your facilitation of The Lion King Experience, decide how you will give the assignment: print the PDFs from the Experience Materials Disc, ask students to write each session’s question in their Pride Journals, or direct them to TheLionKingExperience.com, where a Pride Journal section includes the various prompts. Help! I'm not a theater teacher That’s OK! We’ve built The Lion King Experience so that any educator can facilitate each session. Because foundational concepts and learning themes are delivered through the introductory video, and because Pride work is student-driven and project-based, you can be successful with this material whether you’re a seasoned thespian or new to the stage. We’ve included a theater education glossary in your binder and here online with domain-specific lingo and concepts you might find throughout your lesson plans, or wish to incorporate in your instruction. Frequency The Lion King Experience is intentionally flexible and allows you freedom of scheduling. We recommend that you don’t let more than two weeks pass without facilitating a session so that students can continue building their skills and knowledge over time. The Experience works well when facilitated weekly or twice a week, though more frequent sessions are also successful. As with most educational experiences, consistency is key. 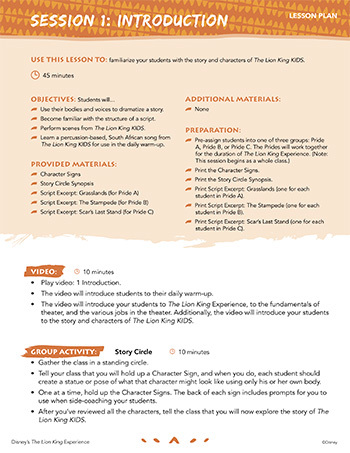 Before the first session Although The Lion King Experience can stand alone (the first session deliberately introduces students to the plot and characters), we recommend having a class read through of The Lion King KIDS or The Lion King JR. before beginning the Experience sessions. In this informal read through, distribute the Actor’s Scripts from your ShowKit™ to the class and assign different students to read different parts. Feel free to alternate readers throughout the process, and play your rehearsal CD each time you reach a song. Encourage the class to sing along if they know the music. What to expect If you or your colleagues are new to theater-education or project-based learning, you may be unaccustomed to the energy and atmosphere of The Lion King Experience. Because it is a creative outlet, theater work can seem frenetic and even loud. 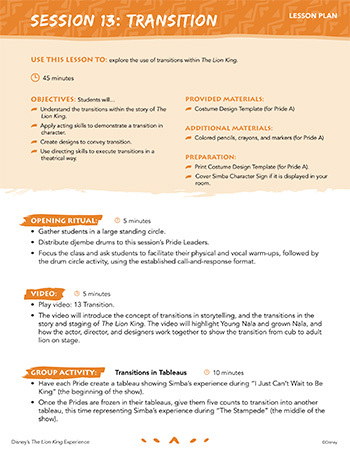 In The Lion King Experience students work as a whole class and in smaller groups to act, sing, dance, design, and write. Much of the growth is what happens enroute to the learning—students negotiate, collaborate, and experiment to complete the various activities. Additionally, because each Pride focuses on a unique topic, you’ll often see movement, hear discussions, and see design work happening at the same time. This is what engagement and joyful learning looks like in the theater. It is your job, as the facilitator, to make sure everyone is on task and safe during the sessions. Be sure to prepare visitors so that they know what they are observing— this kind of work can be foreign to those accustomed to a traditional classroom environment. Classroom management As with all good teaching, classroom management in the theater creates a positive learning environment for you and your students. Early in the Experience, your students will create an ensemble contract in which they will identify how the class and Prides will function. Use the contract as a classroom management tool, and remind the students of their rules. Because theater work can be noisy at times, develop systems for gaining the group’s focus without losing your voice. We recommend that you create a clapping rhythm that the Prides respond back using their djembes or hands. Call and response can be an effective tool for managing focus and transitions. If your Prides struggle with time management or collaboration, assign one student to be a time-keeper, and one to be a peace-keeper within each Pride. Before Rehearsal Begins Ideally, you will facilitate The Lion King Experience with your cast and crew before you begin rehearsals for your production of The Lion King. The Experience will immerse your students in the world of the play and a broad range of theater-making skills. These benefits will combine to make an enriching and rewarding artistic process for your students. Additionally, you can use the character, choreography, design, and directorial ideas generated in the sessions in your production of The Lion King. During the Rehearsal Process You may elect to add additional time into your rehearsal process devoted to The Lion King Experience sessions. 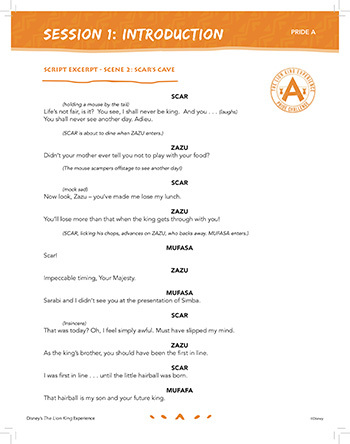 In this format, your students might rehearse the musical several days a week, with an additional day exclusively for The Lion King Experience. This format will allow your cast further opportunities to create a strong ensemble and will give both cast and crew exposure to areas of theater (and characters!) they don’t typically access during rehearsal. With Different Students You might find that The Lion King Experience sessions present an opportunity to engage students outside of your cast in the theatrical process. Perhaps you are interested in exposing students in a different grade to theater arts. The Experience may also align nicely with an existing afterschool program or club (it could be strong content for your drama club, for example). Whatever the case, facilitating The Lion King Experience can be an engaging way to introduce the theater to students outside of your production. Note that the KIDS edition lessons have been created for students in 3rd-5th grade, while the JR. edition includes lessons for 6th-8th graders. Modules Although we recommend completing the full Experience in the suggested sequence, many of the sessions have been designed to standalone. Check your binder for information on which lessons have been designed to work together. Prides Before the first session, divide your class into three Prides. Since the Prides are intended to work together for the duration of the Experience, be mindful of class dynamics when assigning your students to a group. If you are working with a large group, or if your students do better in smaller teams, you may decide to create more than three Prides. Additional djembe drums can be purchased by contacting your Music Theatre International representative. Be sure to print additional Challenge Sheets should you wish to create more Prides. Each session, select a new Pride Leader for each Pride. The Pride Leaders’ jobs are to read the Challenge Sheet aloud to their Prides, keep their group on task, and assist with preparations and clean up. 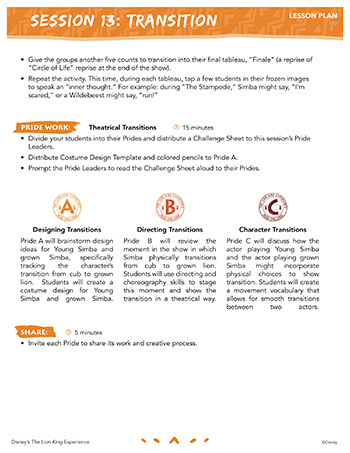 A Pride Leader tracking template is available online. Pride journals Ask each student to bring a notebook to class devoted to The Lion King Experience. 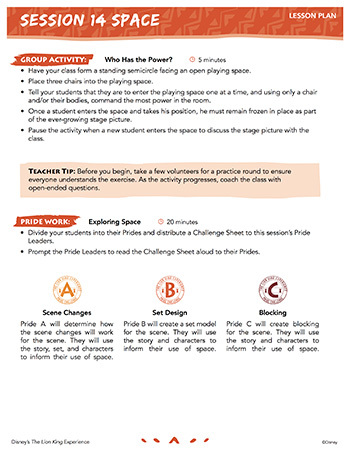 These "Pride Journals" can be used for writing activities throughout the sessions, and for the optional homework assignments that can be found in your lesson plans or on TheLionKingExperience.com. Students do not need an access code or log in to access the Pride Journal section of this website. Preparing your space in advance of each session will help you facilitate The Lion King Experience efficiently. An open space—like a stage—is the perfect environment for The Lion King Experience, though a classroom can work just as well. For all sessions, you will want an open playing space for warm-ups, viewing the introductory video, the group activity, sharing, and reflection. If you are working in a classroom, consider pushing desks or other furniture to the parameter of the room to create your playing space. Designate a spot in the room for each Pride, being sure to place the corresponding djembe drum in each location. Preset any additional materials before your students arrive. Your space is clear of obstacles (for example: by pushing desks to the perimeter). You’ve secured all necessary audio/visual technology. You’ve reviewed the lesson plan, copied all necessary items, and gathered all additional materials. You’ve preset the djembes in their designated spots. Like any immersive educational experience, assessment can help you track your students’ growth and identify opportunities for more exploration and development. Teacher Pre and Post Evaluation Rubric: This rubric assesses theater skills developed over the course of The Lion King Experience, and is tied to the anchor standards set forth in the National Core Arts Standards. Use it after Sessions 1 and 11 to evaluate growth over time. Teacher Pride Session Rubric: This rubric assesses both theater skills, and 21st Century Skills, including: critical thinking, communication, collaboration, and creativity. Use relevant strands after each session to evaluate your Prides’ work. Student Pride Check List: This student-completed check list evaluates the same theater and 21st Century Skills as the Teacher Pride Session Rubric. When students complete the list after each session, they build strong self-assessment skills. Use any combination of these tools to assess The Lion King Experience. You are also free to develop your own assessment tools based on your student population’s needs and school’s learning goals. Director’s Guide This guide provides you and your creative team with all the information you will need to prepare, cast, rehearse, design, direct, and produce this musical, along with ideas for connecting your production to school curriculum and involving your community. Think of the Director’s Guide as a mentor or friend who is there to share the best practices from the field and offer a few tips just when you need them. Piano/Vocal Score This book contains all the show’s written vocal music and piano accompaniment. In addition, the Piano/Vocal Score includes an introduction to music directing and specific suggestions for teaching the show’s score to your cast. Rehearsal & Accompaniment CDs On the Rehearsal CD you will hear kids performing musical numbers and underscored dialogue accompanied by professional studio musicians. This CD will give you and your cast a good sense of the rhythm, tone, and scope of the show, as well as important cues for musical entrances. You’ll use the Accompaniment CD – without the guide vocals – for your performances. Give your music director one copy of each CD and keep the others in your Director’s Guide as backups. Choreography DVD For fully choreographed demonstrations of some of the show’s larger musical numbers, pop your Choreography DVD into your computer or DVD player. If the choreography includes any tricky moves, a demonstration chapter breaks down those steps for performers of all levels. Demonstration DVD This bonus DVD provides extra support for the production requirements that make The Lion King JR. unique. It includes cultural context and pronunciations for the African languages in the show, instructions on djembe drumming, and fundamentals of performing with masks and puppets onstage. Resources Disc This disc contains digital versions of the items included in the Resources section of this guide − budget and program templates, African Languages Guide, sound cues sheet − as well as other essential documents, including audition sides (selections of dialogue), rehearsal calendars, lesson plans, and musical and physical warm-ups. Most documents on the Resources Disc are saved as Microsoft Word or Excel files and can be edited to meet your specific needs. Actor’s Scripts (includes 30) Your young performers will not let these books out of their sight! Each Actor’s Script includes an introduction to musical theater, an overview of the show’s plot and characters; the libretto (script) with interpolated sheet music; and a glossary of theater terms, show vocabulary, and African languages pronunciation. Family Matters (includes 30) These booklets offer the parents and guardians of your cast and crew an easy-to-read overview of putting on a musical, including tips on how they can help you get the job done! If possible, send Family Matters home with your young theater-makers prior to the first rehearsal.